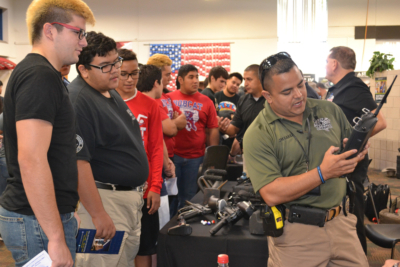 STC’s 6th annual Public Safety Expo takes place Nov. 27 and is free and open to the public. From 10 a.m. to 2 p.m., the event will showcase programs such as fire science, law enforcement program, emergency medical technician and criminal justice. Students and the public will have an opportunity to ask public safety officials questions about life on the job, employment opportunities and educational requirements. The expo also includes informational booths sponsored by various federal, state, and local agencies. This includes McAllen PD, Hidalgo Co. Sheriff’s Office, Hidalgo Co. Constable’s Office Precinct 4, and U.S. Fish and Wildlife. Agencies will roll out specialized units and heavy equipment for exhibition. Local departments will bring out their specialized equipment such as tactical ambulances, watercraft, aircraft, and firefighting equipment for public viewing. The free expo will take place for the first time at STC’s Regional Center for Public campus, which officially opened in September. The Regional Center for Public Safety Excellence is located at 3901 S. Cage Blvd. in Pharr.